Danby's energy efficient, counter-high fridge offers plenty of space for your refrigeration needs in one compact unit. Suitable for rec-rooms, dens and workshops, this 4.4 cu. ft. capacity model includes a convenient beverage dispenser, a full freezer compartment for your frozen items and easy to use button controls for defrosting. Impressing your friends is easy with this limited edition Molson Canadian compact refrigerator by Danby which also includes a FREE reversible Molson Canadian knit hat - perfect for those Canadian winters (or summers!). A compact refrigerator is the ideal solution for smaller living quarters, wet bars, cottages, and student dormitories. Theyre perfect for keeping your favourite foods and drinks cool and refreshing. This great little fridge by Danby can serve up 1.6 cu. ft. (45 L) of cooling area and also boasts a full-width freezer compartment for ice cubes and frozen foods. A compact refrigerator is the ideal solution for smaller living quarters, wet bars, cottages, and student dormitories. They're perfect for keeping your favourite foods and drinks cool and refreshing. This little fridge by Danby serves up 1.6 cu. ft. (45 L) of cooling area and also boasts a full-width freezer compartment for ice cubes and frozen foods. It features a built-in CanStor beverage dispenser and has plenty of room for two-litre bottles. A compact refrigerator is the ideal solution for smaller living quarters, wet bars, cottages, and student dormitories. This fridge by Danby can serve up 1.6 cu. ft. (45 L) of cooling area and also boasts a full-width freezer compartment for ice cubes and frozen foods. It features a built-in CanStor beverage dispenser and has plenty of room for two-litre bottles. The sleek unit comes with a valuable ENERGY STAR rating which will help keep your power bills to a minimum. Drawing inspiration from mid-century styling and simplicity, Danby's patented Contemporary Classic collection of compact refrigerators reimagine retro for the modern consumer. Featuring Danby's exclusive retro-inspired curved door design,flat white door finish, rubber-grip ergonomic handle and stylized worktop, its exterior features are only outmatched by its signature interior. Designer 4.4 cu. ft. Compact Fridge in Spotless Steel - ENERGY STAR® Danby's energy efficient, counter-high fridge offers plenty of space for your refrigeration needs in one compact unit. Suitable for rec-rooms, dens and workshops, this 4.4 cu. 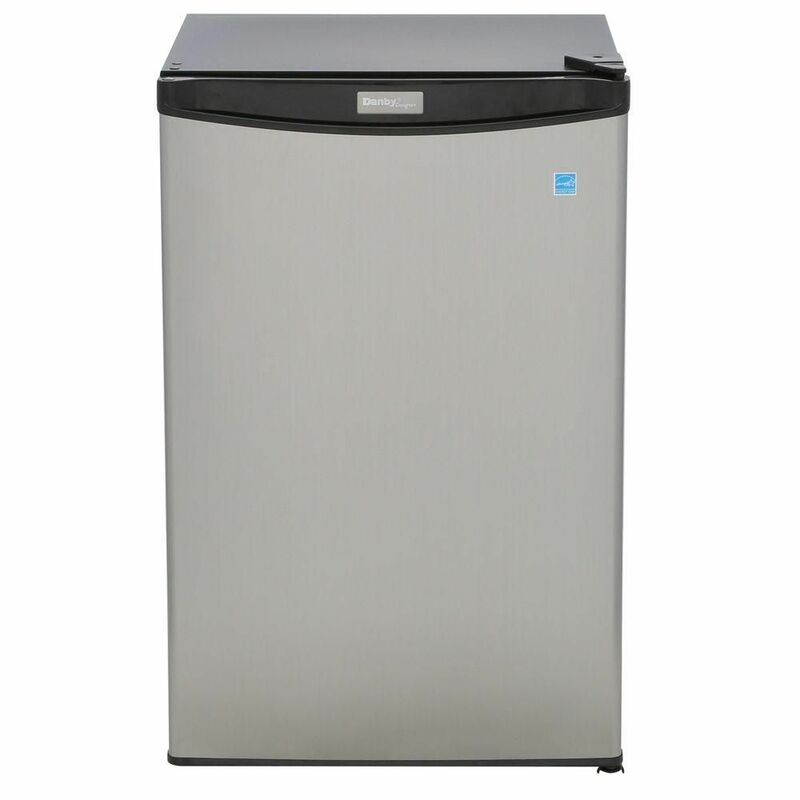 ft. capacity model includes a convenient beverage dispenser, a full freezer compartment for your frozen items and easy to use button controls for defrosting. Designer 4.4 cu. ft. Compact Fridge in Spotless Steel - ENERGY STAR® is rated 3.9 out of 5 by 21. Rated 2 out of 5 by dprice0824 from Supposedly this refrigerator replaced the model we had but it is not at all quite the same. In a... Supposedly this refrigerator replaced the model we had but it is not at all quite the same. In addition it came with several dents. Rated 5 out of 5 by Patricia from I bought this for my mom. She livesin anursing. home.... I bought this for my mom. She livesin anursing. home. Just right fit in her room. She loves it just right size for her. Rated 4 out of 5 by pgiorgi1 from Great Alternative To Costly “Built In” Under Counter Fridges Our last mini fridge gave out in our small office and we didn’t want to spend $1000 on a new built-in model. This fridge was the largest we could find to fill the space of a standard built in and it looks great... and for about $800 less. Giving 4 stars only because the seal is so tight that the door can be hard to open (and sometimes the whole fridge moves instead of the door opening).. maybe the seal will loosen up over time (not sure if would be a good thing though). The 18 month warranty was also a huge plus and the deciding factor. For $25 I bought the Home Depot backed 2 year extended warranty for a total of 3.5 years of not having to worry about an office fridge. Would definitely buy again! Rated 5 out of 5 by Natalia from Great features I bought this a month ago and I am so happy with it.